Trout, ladyfish, catfish, jacks, permit, Bonnet head and black tip sharks, rosette spoonbills, white pelicans, white and blue hearings, sea turtles dolphin swimming next to boat. absolutely just another beautiful day in the keys !!! Well we went out and caught 5 dozen live ballyhoo and then headed out. The reef has been slow so I decided to head offshore. We put 2 wahoo baits on the flat lines (cigar weights 20 foot leader rigged ballyhoo with Hawaiian eye lures in front of them) also some feathers in the riggers for mahi , tuna or sailfish. We headed for the Islamorada hump .No bite on the way out .When we got to the hump the small feather tunas were biting 3 at a time so we were getting some dinner. We had a double on when I looked back and there was a 200 pound marlin chasing our tunas to the boat. We left one in the water to hold him there and my mate Haden put the other one on a bigger hook and rod and he dropped the tuna back. The marlin lit up on the tuna back and forth for what seemed like forever. But he would not take the bait. Didn’t matter it was an awesome site. So we start trolling back in and in 200 feet the wahoo rod goes off and we greased him put them back out and 15 minutes later we get another one. Great day of fishing. We stopped on the reef and put a live bait sailfish spread out for 30 minutes before we went home but no shots. Thanks to mike, mark, and our good luck charm Lauren. I told her in the morning that woman are good luck on my boat. But if we don’t catch anything that means she had done something bad this week. And she would have to confess if she wanted to catch fish guess she was a good girl this week... luckily for her !!!!! Backcountry report – I spent the last 2 days doing half day trips in the backcountry with my good friend Laura. Laura started fishing with me a couple of years ago and she has become a very good fisherman. She gets down 3 or 4 times a year and she keeps me busy. Working 2 rods at a time, baiting her hook and taking all the fish she catches off!!!!. 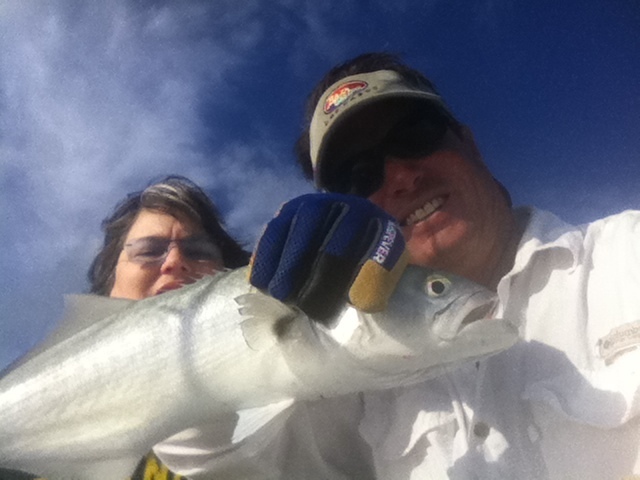 Our first day we stayed close and we caught jacks, mangrove snappers and a big bluefish. Laura had the rod bent constantly. Our second day we took a ride out to Flamingo 20 miles back into the everglades. It was a flat calm day and it was a beautiful ride out there. We got there and her first cast was a 20 inch trout. Well I have to tell you this girl spanked the trout every cast. They didn’t have a chance what an awesome bite . Looking around us there were roseate spoonbills, white pelicans, white and blue hering’s, dolphin and turtles such a beautiful place. Me and Laura had a blast with such an awesome day. Fishing with people like Laura is the reason I love my job. This year we had a very mild winter and the mahi mahi stuck around latter than usual. Also the sail fish bite was a little slow to start. But this week they have started showing up in big numbers. So get down here and catch them while they are hear !!!!! 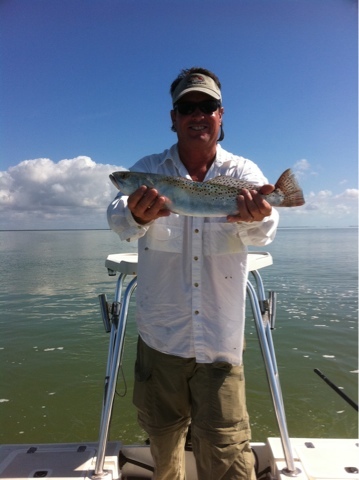 This week in Islamorada aboard the Gold Reserve Charter boat with Capt. Kevin Brown - On are evening trips the bull sharks were biting good 100 lbs. to 200 lbs. 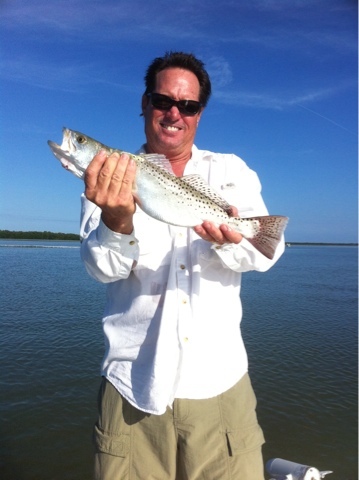 Offshore the king fish were also biting in the 5 to 10 lbs. range. They were scattered from the edge of the reef in 90 ft. of water to 150 ft. of water. Also sailfish and an occasional black fin tuna. Weather was perfect calm seas !!! !